This map charts the change from the single communist nation of the USSR into the confederation of smaller independent nations once dominated by Russia. The fall of the Berlin Wall. The shredding of the Iron Curtain. The end of the Cold War. When Mikhail Gorbachev assumed the reins of power in the Soviet Union in 1985, no one predicted the revolution he would bring. A dedicated reformer, Gorbachev introduced the policies of glasnost and perestroika to the USSR. Glasnost, or openness, meant a greater willingness on the part of Soviet officials to allow western ideas and goods into the USSR. 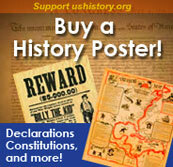 Perestroika was an initiative that allowed limited market incentives to Soviet citizens. Gorbachev hoped these changes would be enough to spark the sluggish Soviet economy. Freedom, however, is addictive. The unraveling of the Soviet Bloc began in Poland in June 1989. Despite previous Soviet military interventions in Hungary, Czechoslovakia, and Poland itself, Polish voters elected a noncommunist opposition government to their legislature. The world watched with anxious eyes, expecting Soviet tanks to roll into Poland preventing the new government from taking power. Here, crews of German troops tear down the Berlin Wall. While many had taken axes and picks to the Wall upon the collapse of Communism in Germany in 1989, the official destruction of the Berlin Wall did not begin until June, 1990. Gorbachev, however, refused to act. Like dominoes, Eastern European communist dictatorships fell one by one. 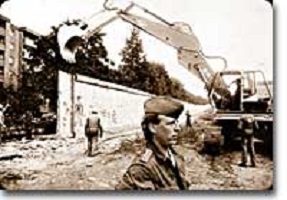 By the fall of 1989, East and West Germans were tearing down the Berlin Wall with pickaxes. Communist regimes were ousted in Hungary and Czechoslovakia. On Christmas Day, the brutal Romanian dictator Nicolae Ceausescu and his wife were summarily executed on live television. Yugoslavia threw off the yoke of communism only to dissolve quickly into a violent civil war. Demands for freedom soon spread to the Soviet Union. The Baltic states of Estonia, Latvia, and Lithuania declared independence. Talks of similar sentiments were heard in Ukraine, the Caucasus, and the Central Asian states. Here Gorbachev wished to draw the line. Self-determination for Eastern Europe was one thing, but he intended to maintain the territorial integrity of the Soviet Union. In 1991, he proposed a Union Treaty, giving greater autonomy to the Soviet republics, while keeping them under central control. That summer, a coup by conservative hardliners took place. 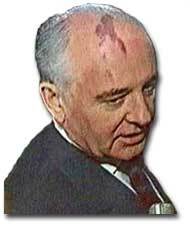 Gorbachev was placed under house arrest. Meanwhile, Boris Yeltsin, the leader of the Russian Soviet Republic, demanded the arrest of the hardliners. The army and the public sided with Yeltsin, and the coup failed. Though Gorbachev was freed, he was left with little legitimacy. Nationalist leaders like Yeltsin were far more popular than he could hope to become. In December 1991, Ukraine, Byelorussia, and Russia itself declared independence and the Soviet Union was dissolved. Gorbachev was a president without a country. Americans were pleasantly shocked, but shocked nonetheless at the turn of events in the Soviet bloc. No serious discourse on any diplomatic levels in the USSR addressed the likelihood of a Soviet collapse. Republicans were quick to claim credit for winning the Cold War. They believed the military spending policies of the Reagan-Bush years forced the Soviets to the brink of economic collapse. Democrats argued that containment of communism was a bipartisan policy for 45 years begun by the Democrat Harry Truman. Others pointed out that no one really won the Cold War. The United States spent trillions of dollars arming themselves for a direct confrontation with the Soviet Union that fortunately never came. Regardless, thousands of American lives were lost waging proxy wars in Korea and Vietnam. Most Americans found it difficult to get used to the idea of no Cold War. Since 1945, Americans were born into a Cold War culture that featured McCarthyist witchhunts, backyard bomb shelters, a space race, a missile crisis, détente, the Soviet invasion of Afghanistan, and the Star Wars defense proposal. Now the enemy was beaten, but the world remained unsafe. In many ways, facing one superpower was simpler than challenging dozens of rogue states and renegade groups sponsoring global terrorism. Americans hoped against hope that the new world order of the 1990s would be marked with the security and prosperity to which they had become accustomed. Bring a sledgehammer to Berlin and you can take home a piece of the Berlin Wall. Lech Walesa is one of only 3 world leaders to address a joint session of the U.S. Congress (along with Marquis de Lafayette and Winston Churchill). What makes Walesa so special anyway? Read this biography prepared by the Noble Foundation.